A bright, sparkling clear beer is highly prized by beer drinkers, yet clear beer can be elusive for the average home brewer. Commercial brewers use fining agents, filtering, and pasteurization techniques to keep their beer crystal clear. While filtering is sometimes used by advanced brewers, much simpler techniques can help improve your clarify. Using a few simple tips, it is not difficult at all for home brewers to match the clarity of commercial beer. 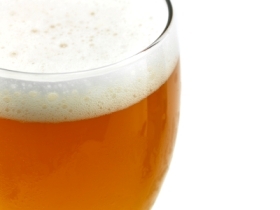 Before we jump into the tips, lets take a quick look at the main causes of cloudiness in beer. Cloudiness generally comes from one of three sources: tannins, proteins and yeast. Tannins are naturally occurring elements of the barley grain husk that is extracted along with sugars during the mashing process. Proteins come both from dark grains and also from certain non-barley grains including wheat, oats and flaked barley. Proteins enhance the head retention and body of the beer, but also hurt the clarity of the beer. It is a delicate balance to achieve a full bodied beer without excessive protein. Finally yeast itself is present in the beer during fermentation and will remain suspended in the beer for some time. Most yeast will eventually precipitate to the bottom of the beer, but it takes considerable time for many yeast strains. Tannins, proteins and yeast also contribute “young” off flavors to the beer, so the quicker you can clear your beer the sooner you can enjoy it! Proteins enhance the body of your beer, but can hurt clarity. Save high protein adjuncts like wheat, flaked barley and very dark malts for wheat and dark beers where clarity is not a significant consideration. If you are brewing a light beer where clarity matters, choose two row pale malt or pale malt extract base and add only enough high protein darker malts to achieve the desired color and body. A few pinches of Irish Moss at the end of the boil can aid the clarity of your finished beer considerably. Irish Moss is a charged adjunct that actually helps tannins and proteins in the hot wort coagulate and quickly fall to the bottom of the boil pot while cooling the beer. If you drop a small amount of Irish Moss in your brew you can actually see the proteins and tannins coagulate into little lumps at the end of the boil. Use an immersion or counter-flow chiller to cool your beer as quickly as possible. If you take your wort from boiling to fermentation temperature quickly, the tannins and proteins will form clumps, fall out, and form a thick layer of trub at the bottom of your boiler. The quicker you can cool the wort, the more dramatic the effect. The less tannins and suspended proteins, the clearer your beer will be. Ideally you would like to cool a boiling 5 gallon batch to room temperature in 15 minutes or less. Flocculation is defined simply as the rate at which a particular yeast strain will fall out of the beer once fermentation is complete. If you choose a yeast strain with a high flocculation rating, it will clear much more quickly than one with a low flocculation rate. Flocculation should not be your only consideration, but if you have a choice, pick a yeast strain that both matches the style of your beer and has medium to high flocculation. A number of fining agents can be added to the finished beer that will aid in clearing the beer quickly. These agents work by attaching themselves to the yeast, tannins and proteins to help them precipitate to the bottom of your fermenter or bottle more quickly. One easily obtained ingredient is clear, plain gelatin from the grocery store. Dissolve it in a few cups of warm sterile water and add it to your secondary fermenter a few days before bottling. Another personal favorite of mine is polyclar. Mix it with a little water and add it to your secondary fermenter a few days before bottling or kegging. Storing beer under refrigeration, called laagering, helps to clear beer rapidly. At lower temperatures it is more difficult for the yeast, tannins and proteins to remain suspended. Cold stored beer will clear much more rapidly than beer stored at room temperature. Note that if you are bottling or naturally carbonating a keg, you need to wait for the beer to become fully carbonated before laagering. Otherwise laagering may slow or kill the yeast resulting in a poorly carbonated beer. I hope these tips help you fight cloudy beer and enjoy your homebrew a little bit more. Please add a comment or subscribe if you enjoyed this article. Visit BrewPoll to vote on this article (guests can vote too!). Not sure what you mean by contacts – we have quite a few people in Australia that use BeerSmith if that is what you mean. I’d just maybe add chilling temperature plays a role, as does separating the break and from the wort. Nice article. BTW Brad, how do you get those little digg tags in your posts? The little icons are a wordpress plugin called sociable. You can get it from the wordpress plugin page. If you want a good counter flow wort chiller, this is mine: it’s about 9mtrs long copper 1/2inch pipe with a 25cm/1inch clear outer plastic hose. It will chill the wort down below 25c in one pass. I go from the boiler straight to the fermenters (double bach 50ltrs) in less then 10mins. I use a pump to push it through. Thanks! My husband is trying this whole brewing thing and has enjoyed it so much! These tips Im sure will really help for he’s next batch. i have bottled up my brew after second fermentation and it has been out side for over 2 weeks but not cleared,do you have any idea why? It could be several reasons – the two main issues are yeast and proteins. Yeast tends to fall out relatively quickly (depending on the strain) but some proteins can linger and create a lasting chill haze. The methods in the article are some of the better ways to deal with this. You mention clear, plain gelatin how much should be used? By the way; love the software and the website. This is a great place full of useful information. I usually include one packet of gelatin for 5 gallons – near the end of the secondary – perhaps a day or two before bottling. If you fully carb it in the keg then drop the temp to cold crash, will it not make it asorb more c02? Then when you bring in to serving temp it will foam really bad. Thanks for you time to answer my question. It may do that immediately after the cold crash, but the keg will stabilize to the new keg pressure and temperature after a few days. Thanks for the article. I’ve read several places that gelatin added to the secondary will inhibit bottle conditioning by pulling too many yeast out of suspension. What is your experience with this? Have you ever tried adding gelatin to the priming bucket at the time of bottling as suggested by Charlie Papazian? If not, do you think it would work? immersion vs. counterflow in terms of precipitating proteins/tannins: if immersion allows these to settle to the bottom of the kettle, then wouldn’t a counterflow chiller rob you of this benefit, since everything that enters the counterflow goes into your fermenter? Howdy all!! That’s a pretty neat thing to do if the label is printed on the bottle. 😛 And as far as the brewing your own bottle is concerned its a tasking process to do. Why not move with friends to grab a bottle and have a sip somewhere cozy. I was looking forward to a reply to Mark’s question (Nov 23, 2012) regarding gelatin clearing pulling out too much yeast thus inhibiting carbonation. I always wanted to brew my own beer and this is a great site to learn more about it. These days we all work so hard, its nice to know to can explore different hobbies outside of work and this is definitely on one of my to do list. I love to entertain and who doesn’t love a nice glass of beer. Its more rewarding when you made it yourself. There is another new way to improve the clarity with a special top that holds the yeast. Just Google Pozible Cleer Beer and you can be one of the first to own this at about $2 a cap. Yet another informative, succinctly well written article !!! Thanks !! Hi I am a real novice when it comes to beer brewing have done three and first two were fine.Most recent brew is cloudy after adding finings to second ferment.Have left for four weeks now and still cloudy.Any advice would be much appreciated. I am fond of brewing my own beer and always like to read about brewing to enhance my knowledge. I find your article very helpful.